Canada is one of those countries which have designed and employed a point based system for allocating skilled permanent visas to the talented professionals from overseas countries. As per the point system, the applicants are assessed and subsequently, selected based on their point score achieved based on age, education, language ability, work experience, etc. factors. However, sometimes, this point score doesn’t help the deserving applicants to get the Express Entry ITA (Invitation to Apply) from Immigration Refugees and Citizenship Canada (IRCC). Here are a few key tips through which you can raise your express entry point score or CRS (Comprehensive Ranking System) score. Key Tips to raise Express Entry CRS score? There are various ways you can enhance your Comprehensive Ranking System (CRS) Score. However, not many applicants are often aware of these key methods. Usually, most of the applicants mention their primary language as English. However, if you know the secondary language (i.e. French), as well, you can get additional CRS points for the same. Vice versa of it can also be done if your primary language is French, but you also know English as a secondary language. Not all applicants know that as per express entry rule changes a few months back, the applicants can earn the additional points for their siblings already working in Canada. Hence, if you have your sibling already settled in Canada, you can add additional CRS points in your express entry profile based on the same. If you have provided an IELTS Test with minimum CLB 7 level of proficiency, you can go on to raise your IELTS test score to earn more CRS points based on the same. You can earn massive points if a Canadian province has nominated you for Canadian permanent residency. To get the provincial nomination you need to get notification from a province and subsequently, apply in the Express Entry Stream of the Provincial Nominee Program (PNP). Most of the provinces in Canada has a Provincial Nominee Program through which they invite and nominate suitable skilled workers for Canadian permanent residency. You also get CRS points for your partner’s credentials. Moreover, if you have a partner, who can earn more CRS points in express entry than you. It’s worth making him the primary applicant. 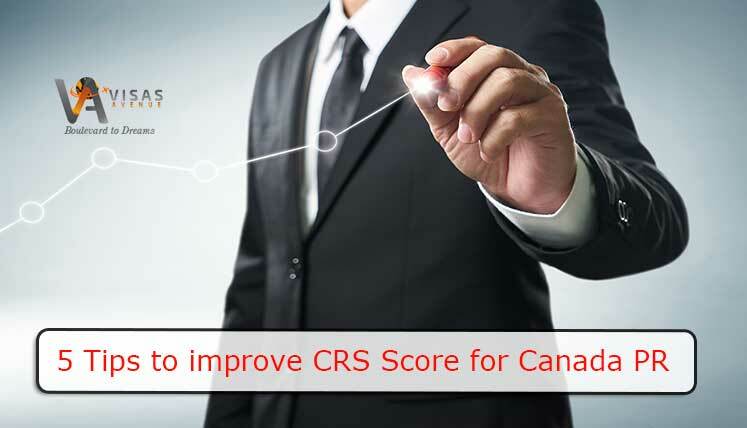 Also read-How To Enhance Your CRS Score To Get Canadian PR Invitation Via Express Entry? Provincial nomination can add as many as 600 additional CRS Points for your express entry CRS score. Such huge additional points help an applicant get ITA (Invitation to Apply) for Canadian PR in the subsequent draw of Federal Express Entry System. To find alternate pathways to apply Canadian PR or to know how to increase your CRS score, you may get in touch most qualified Canadian immigration experts at Visas Avenue- the top and trusted Canadian Visa consultancy Company in India. You may call Visas Avenue migration experts on Toll-Free Number- 78-18-000-777. Moreover, to get your eligibility checked and subsequently, get a call from the expert, you may fill the free assessment form.